Hellor beautiful peoples ! I am Final Link ! a nub in the great runescape world. 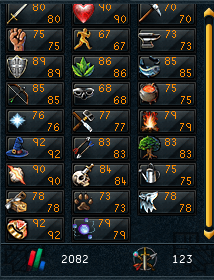 Working my way up to become a great PVMer,and to get MAX and hopefully Comp cape ! woooh ! I have set many goals for myself and side goals to keep myself entertained . I used to be a DIY player "mcfs" and took a break from rs before the official ironman came out,so i decided to try it out, i ended up not liking it. That is it for now Probably will have more goals sooner or later.